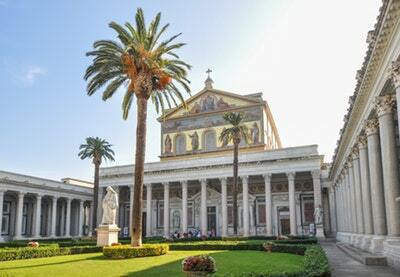 San Paolo fuori le Mura (Saint Paul Outside the Walls) is located south of Rome outside the ancient walls along the via Ostiense. It is one of the four great papal basilicas of Rome and thus has "extraterritorial" privileges. According to tradition Paul was buried in a vineyard on which this basilica is built. A shrine long existed here and the first church was begun in A.D. 384. It was enlarged and rebuilt a number of times. The most recent rebuild comes after the great fire of July 1823 when the basilica was gutted. It is believed that the Apostle Paul was buried in a sarcophagus that is located below the main altar of the church.